Here's the latest news about ePLDT and Dell EMC's partnership optimizing enterprise services in the IT industry. 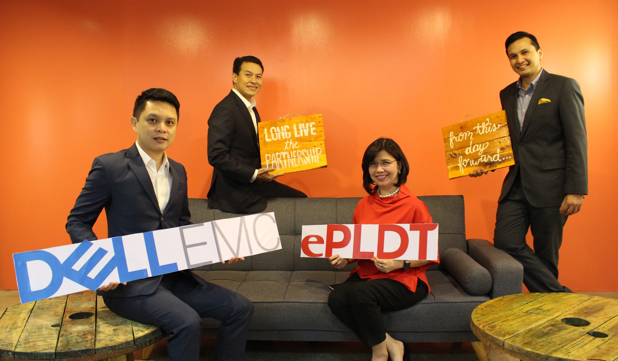 ​ePLDT, Inc., an industry-leading enabler of digital business solutions to enterprises in the Philippines, recently penned a strategic partnership with Dell EMC to align their strengths and technical expertise in offering transformational business value to clients in the country. (L-R) Chris Papa, Dell EMC Channels General Manager; Ronnie Latinazo, Dell EMC Country General Manager; Nerisse Ramos, ePLDT Group Chief Operating Officer; Nico Alcoseba, PLDT VP & Head of Disruptive Business Group strengthen their partnership to better offer valuable business solutions to customers in the Philippines. ​​With the partnership, ePLDT and Dell EMC will be able to simplify enterprise processes for customers through robust solutions—from a single vendor consortium with a single point of contact. Dell EMC is a subsidiary of Dell Inc., which offers a trusted foundation for businesses to transform IT through the creation of hybrid cloud and transform business through the creation of cloud-native applications, and big data solutions.